I hope this newsletter finds you well. This past week has been a little rough because I lost my voice on Sunday, and my asthma has kicked up so crazy that I've only been able to work part time this week. We're still rocking and rolling here though figuratively and literally with all these earthquakes lately. 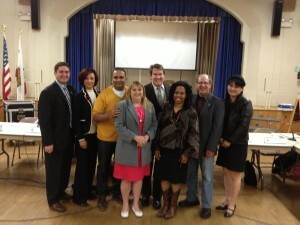 The Region 5 elections in the Hollywood and Central area were great on Sunday. I got to swing by half of the 8 polling locations in the morning before heading over to Chatsworth to join in on Councilmember Mitch Englander's horse ride with Mayor Garcetti. 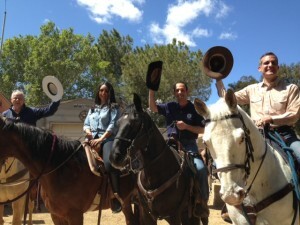 Organized by ETI Coral 54 members, Mary Kaufman (Chatsworth Neighborhood Council) and Charlotte Brodie, I joined over 100 equestrians, including Councilmembers Nury Martinez and Tom LaBonge, to enjoy a 2 hour ride through the beautiful Chatsworth hills. I was surrounded by board members from the Chatsworth, Sylmar, Foothill Trails and Sun Valley Area Neighborhood Councils so that was pretty neat. Check out this great video about the ride! After the lovely ride, it was back to the remaining polling locations, which included Hollywood United Neighborhood Council's corner of the Gelson's parking lot. The high traffic area brought them 306 voters, a voter improvement of 774% from 2012. This puts HUNC (coolest acronym!) in the lead for a visit by Mayor Garcetti. Overall, Region 5 was up 44.9% in voter turnout from 2012 so we are all thrilled with their hard work. On Tuesday night, I was able to make the Board of Neighborhood Commissioners meeting to hear Board of Public Works Commission President Kevin James speak on leadership and Neighborhood Councils. Commissioner James was thoughtful and practical in his collaborative approach, and I enjoyed his talk. I was also happy to welcome our new Commissioner for the West area, Palms Neighborhood Council President Eli Lipmen. Commissioner Lipmen brings a wealth of tech experience, which I think is going to be perfect for tracking the impact of Neighborhood Councils. On Wednesday night, I missed the Community Briefing Session on Save Our Streets LA at City Hall because I had the pleasure of going back out to Chatsworth again to swear-in their newly selected board. The board was very gracious in accommodating my barely there voice as I administered the oath. Chatsworth Neighborhood Council conducted a selection this year and did a fantastic job in outreach, getting 690 voters. It was noted that all of their 21 board members had to receive over 300 votes in order to make it on the board this year. A lot of great outreach is happening for elections, too, across the City. I love Los Feliz Neighborhood Council's new outreach video for voters: LosFelizNC.org/election-2014 So cute! Yesterday, we ran Region 6's elections in the Central area. Thanks to our amazing volunteers, we were able to keep things going over the day of great voter turnout. We had a 23% increase in voters from 2012 in this region. MacArthur Park Neighborhood Council, which had a record high voter turnout of 306 that beat their goal of getting 1% of their population to come and vote, had people who were first time voters in their lives participate. That was awesome. Great job to the Neighborhood Councils in this region along with their volunteers and our election team, particularly their Independent Election Administrators, Jay Handal and Terrence Gomes. We are halfway done with the elections, and we have a 47% increase in voters from 2012 thus far, which is pretty amazing. Thanks again for all that you do to Empower LA! If I don't see you at the LANNC, have a terrific weekend!